↑ 3,0 3,1 3,2 American National Biography — 1999. ↑ 5,0 5,1 Hansen, Gladys (1995). ↑ Carr, Patricia E. (July 1975). ↑ Weeks, David; James, Jamie (1996). ↑ 9,0 9,1 "Joshua Abraham Norton" at 1820Settlers.com. ↑ William Drury, Norton I: Emperor of the United States (Dodd, Mead & Co., 1986), pp.10-15. ↑ William Drury, Norton I: Emperor of the United States (Dodd, Mead & Co., 1986), p.14. ↑ "Le Roi Est Mort". ↑ William Drury, Norton I: Emperor of the United States (Dodd, Mead & Co., 1986), p.10. ↑ Cowan, Robert (October 1923). ↑ "1820 Settler Party: Willson" at 1820Settlers.com. ↑ The Emperor's Bridge Campaign, "Homing in on the Birth Date?" ↑ "Norton, Joshua Abraham – newspaper cutting" at 1820Settlers.com. ↑ "Joshua Abraham Norton, b. 4 February 1818," The Emperor's Bridge Campaign, 8 February 2015. 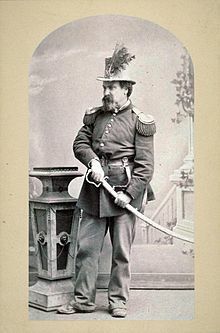 ↑ "Zpub, Emperor Norton Records & the Emperor's Birth Date: A Case Study in Good Intentions & Undue Influence," The Emperor's Bridge Campaign, 16 February 2015. ↑ Nolte, Carl (September 17, 2009). ↑ Mencken, Henry Louis; George Jean Nathan (1951). ↑ 23,0 23,1 Moylan, Peter.